Stanley Hiller flew the first successful American co-axial helicopter, the XH-44, in July 1944, when he was only 19 years old. It also featured the world's first successful all-metal rigid-rotor blades. Hiller had learned to fly from his father at an early age, and at 16, Hiller had started a business building small gasoline engine model cars; revenue eventually grew to $100,000. Hiller became interested in helicopters in 1937 when he saw pictures of the Focke Wulf Fw 61 and Sikorsky's VS-300 in 1939. Hiller felt the tail rotors used on the VS-300 and the outriggers on the Fw 61 were wasteful and possibly unnecessary. The XH-44 evaluated three different rotor configurations: rigid, articulated, and semi-rigid, which was selected. The engine was uprated from a 90hp Franklin to a 125hp Lycoming. 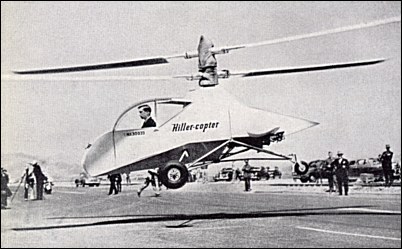 The XH-44 was the first successful helicopter west of New York, and Hiller made public demonstrations of the XH-44 in nearby San Francisco.